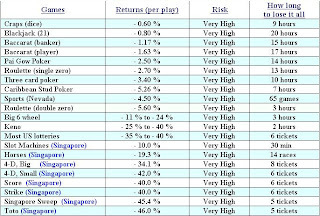 Lifelong Financial Freedom in Singapore: Gambling: What are the odds? I have taken the above information from "http://www.askdrmoney.com/gambling_investing_odds.htm". It shows you the returns for different types of gambling. As what I have expected, all returns are negative. I simply don't understand why people still gamble when the odds are against them. I still can accept when senior citizen queue up to buy 4D or TOTO as they might be lack of finance knowledge. But I saw in these recent year a lot of youngsters and even professionals have this habits too. I have a lot of questions marks on my heads. The answers I get from them is "No buy, no hope, Got buy, got hope" (directly translation from chinese). The only explanation to myself is people are normally "short-sighted". What they see is the winning price, and not what the accumlated amount that they have pay out, and not even the odds. To admit, I gambled in the past in term of 4D and TOTO. I have lost $200 in total including $50 to buy my flat unit number during my wedding day. I have stopped gambling ever since I am exposed to finance knowledge. Of course if I went for genting holiday, I will still play the jackpot machine. But that is for pleasure and I am not expecting to win any thing.